What a difference a fortnight makes! Saracens' fans didn't dare hope they might see such a turn around in their team's fortunes, but they were surprised and delighted with the guys' performance against the Ospreys at Vicarage Road. It was one of the best games I have ever witnessed Saracens play, in my 4+ years of watching them. Everyone from 1 to 22 put their all into the game. The Ospreys started brightly enough, with James Hook slotting a penalty in the 2nd minute. 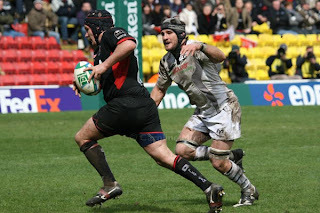 Sarries' Glen Jackson replied with two of his own in the 10th and 15th minutes. By the half hour, Sarries had lost both Brent Russell (hamstring) and Andy Farrell (shoulder) to injury. That could have proved to be unsettling for the team, but subs Francicso Leonelli and Adam Powell slotted in with barely a stutter. Just before half time, Paul Gustard made a break but was brought up within inches short of the line, the TMO having to decide, much to the disappointment of the home fans. Leonelli scored a crucial try in the 2nd mintue of the new half, with Glen Jackson having no trouble with the wide out conversion. In the 57th minute, Sarries were all but home again when Osprey Lee Byrne knocked on deliberately in a desparate attempt at defence. The ref had no hesitation in sending him to the bin for 10 minutes for cynical play, and Jackson slotted the extras to take Sarries to a 16-3 lead. After a raft of subsitutions for both sides, Osprey replacement Paul James managed to burrow over from close range for a score in the 74th minute. That meant a nailbiling last 6 minutes for Sarries, with only a 6 point advantage. The Black defensive line held firm, and they even went on the attack again. Working themselves into the opposition 22, and up towards the 10m line with 2 minutes to go, Glen Jackson kept a calm head and true aim with the boot to drop a goal and put Sarries 9 points up. It was then a case of keeping possession, defending to the death and ticking the clock down. 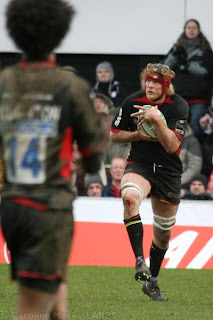 With the crowd counting down the seconds, Sarries regained possession of the ball, hoofed it into the stands and propelled themselves into an historic Heineken Cup Semi Final against Munster at the Ricoh Arena on 27th April. The sellout home crowd went nuts, such success all too rare in important games at Vicarage Road. Richard Hill, a master all afternoon of the dark arts of defence and disruption, was Man of the Match. Let's hope the team can take him to greater heights in the next coupld of rounds, and perhaps see him lift the Heineken Cup before he retires at the end of the season. That would indeed be a fitting end to the great man's career. Allez Les Noirs! See more photos from the game.